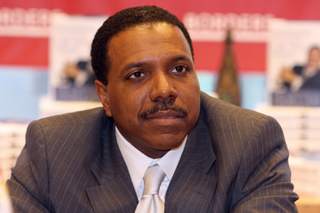 On the streets of any hood in the United States, Creflo Dollar, the kingpin behind World Changers Church International, would be called a hustler. Behind the pulpit, however, he’s called pastor, and if that’s not a sin, I don’t know what else to call it. Dollar, who made headlines in 2012 for allegedly assaulting his then 15-year-old daughter, has now launched a full-fledged campaign to pressure his congregation into buying him a new, $65 million Gulfstream G650 jet. Apparently, the right reverend was traveling on his old private jet when the aircraft experienced engine failure. Fortunately, the pilot was able to land safely without any injuries or fatalities, but the incident was so frightening, Dollar felt compelled to reach out to his flock. We are asking members, partners and supporters of this ministry to assist in the undertaking of an initiative called Project G650. The mission of Project G650 is to acquire a Gulfstream G650 airplane so that Pastors Creflo and Taffi and World Changers Church International can continue to blanket the globe with the Gospel of grace. We are believing for 200,000 people to give contributions of 300 US dollars or more to turn this dream into a reality—and allow us to retire the aircraft that served us well for many years. To which, the question has to be asked: Is American Airlines closed? Did Delta go on break? According to a recent Atlanta Blackstar report, Dollar has an estimated net worth of $27 million—900 times more than the $29,640 average annual income in College Park, Ga., where he holds court. So, for argument’s sake, let’s say that he’s such a VIP that it’s just absolutely necessary for him to own a private jet—or, maybe, he’s just allergic to those two-pack Biscoff cookies airlines pass out in-flight. But why can’t he pay for it himself? After all, this is a man who tells his followers that Jesus wants them to be rich, and if you pay him, he’ll show you how to do it. He unapologetically flaunts his wealth to prove to his congregation that the God of the Holy Bible will make those faithful to him richer than Empire’s Lucious Lyon. His prosperity gospel has encouraged more materialism and greed that any episode of Basketball Wives ever could. And he walks around with more gold than Trinidad James. He’s too broke, though, to buy his own plane? Dollar would rather press people living below the federal poverty line—people with no jobs, no insurance, no health care and, in some cases, no homes—into funding his luxurious travel? Security would go and apprehend them, and once we got them all together, we’d line them up in the front and pass out Uzis by the ushers and point our Uzis right at all those non-tithing members ’cause we want God to come to church, and at the count of three Jesuses we’d shoot them all dead. And then we’d take them out the side door there, have a big hole, bury them and then go ahead and have church and have the anointing. Aren’t you glad we’re under the blood of Jesus? Because if we were not under the blood of Jesus, I would certainly try it. A man of God, ladies and gentlemen. A man of God. He’s a charlatan, and I’m not at all surprised that he’s making this outrageous request. Nor will I be surprised when he reaches his goal. It’s just pathetic that during a time of such unrest and uprising in black America—when food safety is nonexistent, public education is dismal and the bodies of our children are piling up while politicians wave for the cameras—Dollar is busy scheming. Instead of putting millions into the community, he’s pulling millions out of it just so he can fly above it all and tell his congregation to say “praise the Lord” while he does. And there is nothing holy about that.